Unfortunately eMusic does not have the classic version, but you can choose from the Ensemble Percussione Ricerca, Shanghai Film Orchestra, Société de musique contemporaine du Québec or even a version for solo flute. 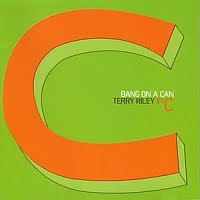 But I recommend Bang On A Can's version, recorded 1998, released in 2001. Compared with the original the tempo is slower, the timbre warmer and the pulse an octave lower. This all combines to create a mellow version than the original. Really you need both. Or, get a few friends together, print off the score and give it a try yourself! Oh, that takes me back. When I was a college sophomore back in 1993, I took part in a performance of "In C" with other music composition majors, and I was the poor guy who had to bang out the half-note C's the whole time. We rehearsed it twice, the first time taking 45 minutes, the second time taking well over an hour. When we actually performed it, it was about 50 minutes.